Barack Obama is an American politician. A member of the Democratic Party, he served as the 44th President of the United States, from January 20, 2009 to January 20, 2017. He was elected to the position in 2008 and 2012. He was previously a Member of the Illinois Senate, from January 8, 1997 to November 4, 2004, and a U.S. 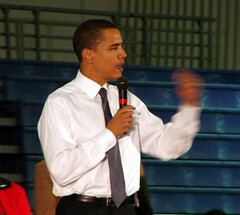 Senator from Illinois, from January 3, 2005 to November 16, 2008. He was awarded the Nobel Prize for Peace in 2009. He was Time Magazine’s Person of the Year for 2008 and 2012. President Obama is the first person of African descent to serve as President of the United States. President Obama was born in Honolulu, Hawaii, U.S. His father was black and his mother was white. His father, Barack Obama, a governmental economist, was born in Nyang’oma Kogelo, Rachuonyo District, Kenya Colony, and was a Kenyan of the Luo tribe. His mother, Stanley Ann (Dunham), an anthropologist, was born in Wichita, Kansas, and had English, and small amounts (to varying degrees) of Scottish, Irish, German, Welsh, Swiss-German, and French, ancestry. His father was a Muslim and his mother was from a family of non-practicing Baptists and Methodists. President Obama practices Protestant Christianity. President Obama is married to lawyer and writer Michelle Obama (born Michelle LaVaughn Robinson). Their children are Malia Obama and Sasha Obama. He lived in Indonesia from six to ten years old. President Obama’s paternal grandfather was Onyango (whose name was changed to Hussein Onyango Obama; the son of Obama and Nyaoke). Onyango was born in Alego. President Obama’s great-grandfather Obama was the son of Opiyo and Marrgorat. President Obama’s paternal grandmother was Habibah Akumu Nyanjoga (the daughter of Njango/Njoga and Bwogi Otore). Habibah was born in Karabondi. Njoga was the son of Okela. President Obama’s maternal grandfather was Stanley Armour Dunham (the son of Ralph Waldo Emerson Dunham, Sr. and Ruth Lucille Armour). Stanley was born in Kansas. Ralph was the son of Jacob William Dunham and Mary Ann Kearney. Ruth was the daughter of Harry Ellington Armour and Gabriella Lee “Gabbie” Clark. President Obama’s maternal grandmother was Madelyn Lee Payne (the daughter of Rolla Charles Payne and Leona Belle McCurry). Madelyn was born in Kansas. Rolla was the son of Charles Thomas Payne and Della Lillian Wolfley. Leona was the daughter of Thomas Creekmore McCurry and Margaret Belle Wright. President Obama’s matrilineal line can be traced to Sarah Wade “Sally” Ray, who was born, c. 1793, likely in Virginia. Aside from being the first person of African descent to serve as President of the United States, President Obama is the first person of African descent to be the presidential nominee of a major American party. President Obama has distant Irish ancestry, going back to his great-great-great-grandfather, Falmouth Kearney, who arrived in the States in 1850, from Moneygall in Ireland. Research done by a team of genealogists has suggested that President Obama’s mother had remote African-American ancestry (in the 1600s), through possible descent from a slave named John Punch. In page 13 of his autobiography, Dreams from My Father: A Story of Race and Inheritance (1995), President Obama writes that a distant ancestor of his mother’s “had indeed been a full-blooded Cherokee” [Native American]. No Cherokee Native American ancestry has yet been documented/verified for President Obama. President Obama has referred to his mother’s ancestors as “Scotch-Irish mostly”, though their ancestry was predominantly English, with a smaller amount of Scots-Irish. One of President Obama’s maternal ancestors, his ninth great-grandfather, Richard Singletary, was born, c. 1585, in Surfleet, Lincolnshire, England, to Francis Singletary and Agnes Cook. Richard’s son, Jonathan Singletary (later Dunham), was born, c. 1640, in Newbury, Massachusetts Bay Colony. President Obama’s “Dunham” line traces back to Jonathan. Akumu’s mother was named Bwogi Otore. Njoga was the son of Okela. Della’s middle name is Lillian. Obama didn’t deserve a lot of his poor treatment but he promoted the racist one drop rule so I can’t say I’m a fan. He’s not African American. He’s white American and black African. This makes him mixed. Something I’ve noticed is that with any mixed race person claiming only black, it’s usually because they’re racist/prejudice. ex: Barack Obama said his grandmother is a “typical white person” who has fears about black men. He was attempting to explain a portion of his speech on race earlier this week—specifically, the statement that his white grandmother gets nervous when a black man approaches her on the street. The only reason Barack Obama isn’t called mixed race is because of racist Americans who are black, white, mixed, asian, etc who uphold the racist one drop rule. That’s nonsense. I identify as black ,and I am of mixed ethnicity, pretty much everyone I know is. I’m not racist or prejudice. I don’t hate my white bloodlines. I don’t think black people are better than white people. I just see myself as a black man. He’s not even ethnically African American. He shares no history with black Americans. It’s like me being half Japanese and half white, being raised in Korea by my white parent and then claiming to be just Korean. Makes no sense. He’s the first mixed race president. Can you cite some of President Obama’s recent racist comments? Also, what are Hillary Clinton’s criminal offenses? @Fuzzybear, he laughed at white Americans who believe that reverse racism exists. @cwm85 my paternal grandfather is Serer (a Tribe from West Africa) and even though I’m mixed I always identify as Serer. It doesn’t mean that I’m ashamed of my Morrocan Berber, Middle Eastern and English heritage. My last name is Serer and where I live you always identify with your father’s surname. It doesn’t make you a racist or a self hater. @cwm85 oh and Scottish heritage. I forgot about that….. Still not a self-hater!